SEFC Bull and Bear trading system is a forex strategy trend following. SEFC Bull and Bear indicator is a repaint indicator but the othe indicatrs used not repaint. SEFC Bull and BEARS (20 periods) with RSX 21 and Stochastic indicator (111,3,3, close smoothed). When you see a buy arrow, confirm the following before you place a trade. f) Stochastic indicator green line above RSX indicator in the same window of SEFX Bull and Bears indicator. When you see a sell arrow, confirm the following before you place a trade. f) Stochastic indicator green line below RSX indicator in the same window of SEFX Bull and Bears indicator. Place your stop loss below ir above the previous swing High/Low. Take profit: ratio 1:1 stop loss. 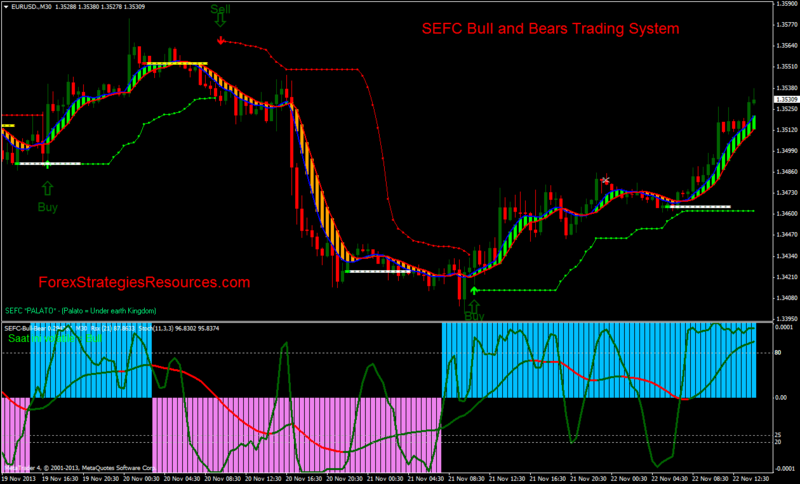 SEFC Bull and Bears Trading System (Template and indicators. SEFC Bull and Bears with RSX.